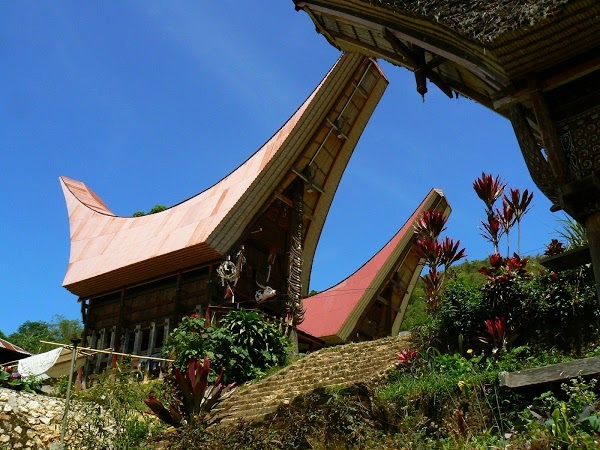 In Tana Toraja Regency, you can find many traditional villages. One of them is located in North Sangalla District. The name is Tumbang Datu-Bebo Vilage. Tourists often come to this settlement to witness Tongkonan, a fountain, traditional ceremonies, ancient tombstones, and much more. The villagers retain their culture and aren’t likely to get affected by modernization. Another best feature is Basse Kasalle. It is a giant tree located on the hill. It becomes a symbol of agreement between several tribes nearby. Tongkonan or traditional houses of Tana Toraja become a common sight in Tumbang Datu-Bebo Village. Their shape is unique and their size is enormous. These houses are located in a grassy area. The formation looks stunning, as well. Sometimes, you can see many buffalos near to these houses. It is because the villagers consider this animal as a valuable belonging. They also use them as part of traditional ceremonies. In the back, there are plethora trees. Thus, the atmosphere is relaxing and shady. More than a hundred of years ago, there was a big war in Tana Toraja. Many new villages were born from it. One of them is Tumbang Datu-Bebo. This settlement is famous for its culture. The location is in North Sangalla, so it is quite reachable. The best feature is Tongkonan. The villagers use such traditional house to perform ceremonies and burial rituals. The village is also near to interesting tourist spots such as a fountain, forts, and other historical places. With all those features, Datu-Bebo Village becomes a valuable village to visit. Aside from those interesting attractions, the village is near to a hill. Thus, you can take an opportunity to explore and climb the hill with your friends. Once you reach the top of the hill, you can see sandalwood. This tree becomes a symbol of peace amongst the tribes. It also becomes a landmark to commemorate Basse Kasalle (a pact of tribes). Somehow, it is also suitable for a background of photography. As for the tips, you should have prepared everything prior to visiting Datu-Bebo Village. For example, you must carry a map. It is because beginners often get lost in this location. If necessary, you can hire a local guide. He may help you get around the village and visit nearby attractions. The hill is a must, for sure. Still, many other tourist spots are also located near to this settlement. With proper information and money, you can explore them all. However, make sure to come with a good vehicle! From Jakarta, there are many checkpoints to visit. First, it is Makassar City. It is the capital of South Sulawesi Province after all. The fastest way to reach it is by airplane. In this case, your destination is Sultan Hasanuddin International Airport. Once you reach Makassar, it is time to head to North Sangalla District. The distance is 311 km, so it takes about 7-8 hours. You can use Poros Barru – Makassar Street, actually.